As you can see, I’m catching up with posting about my latest releases! 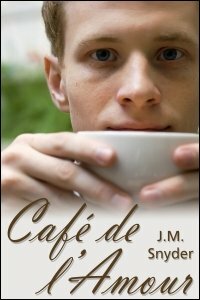 Last week I published a new story, Cafe de l’Amour. Barista Austin falls for Seth Jackson the moment the man enters Lakeside Cafe. Seth seems just as interested, but Austin’s too shy to pursue a relationship on the other side of the counter. When Seth visits with a male “friend” in tow, Austin worries he might have missed his chance. Seth’s just as suspicious of Austin’s best friend, Josh, who hangs out at the cafe. A lunch date offers a chance to clear the air between them. Will Seth and Austin make a special blend, or will Josh turn things sour?